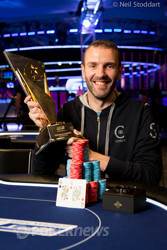 Laurent Polito Wins EPT Barcelona €10,000 High Roller (€270,229)! After a very long day of action yesterday for Day 2 of the 2012 PokerStars.com EPT Barcelona €10,000 High Roller, Day 3 ended in a flash. It took just about seven hours of play before crowning a champion and that player proved to be France's Laurent Polito, who earned €270,229, the title and the Shamballa Jewels bracelet. Polito began the day third in chips behind Tobias Reinkemeier and Alex Bilokur. Together, the three of them made it down to three-handed play before Reinkemeier fell in third place, setting the stage for a heads-up clinic put on by Polito. When the heads-up match began, Polito was down nearly one million in chips, but that didn't deter him from crushing. First, a deal was struck between the two where Bilokur would take home €295,451 and Polito €270,229, based on the chip counts. Left to play for was the title, the trophy and the Shamballa bracelet. Nearly the entire match went Polito's way, as he constantly had the upper hand (or better hand) against Bilokur, specifically at the showdown. Bilokur just couldn't get anything going and Polito stole the show by winning pot after pot. After taking the chip lead, Polito continued to take chunks from Bilokur before the final hand came up. The final hand summed up the entire heads-up match altogether, as it was Polito who held the better of it when Bilokur put the money in. Even though Bilokur went all in with pocket nines, which could be considered a preflop monster heads up, Polito held two queens. No help came for Bilokur on the flop, turn or river and he was eliminated in second place. That wraps up PokerNews' coverage from the €10,000 High Roller, but there's still plenty of action left here at EPT Barcelona. The Main Event still has four players remaining with over €1 million to first place. Be sure to check out that coverage as well. Alex Bilokur raised to 80,000 on the button and Laurent Polito reraised to 230,000 from the big blind. With a stack of about 1.25 million to start the hand, Bilokur moved all in. Polito's eyes lit up when he heard those sweat words from Bilokur and he quickly called. The flop came down and Polito's queens stood strong. The was placed out on the turn, which meant Bilokur needed a nine and a nine only on the river to stay alive. The river card completed the board with the and Bilokur was officially eliminated — the queens for Polito had done it. Due to the deal struck earlier when heads-up play began, Bilokur took home €295,451, which was actually the larger prize of the two. 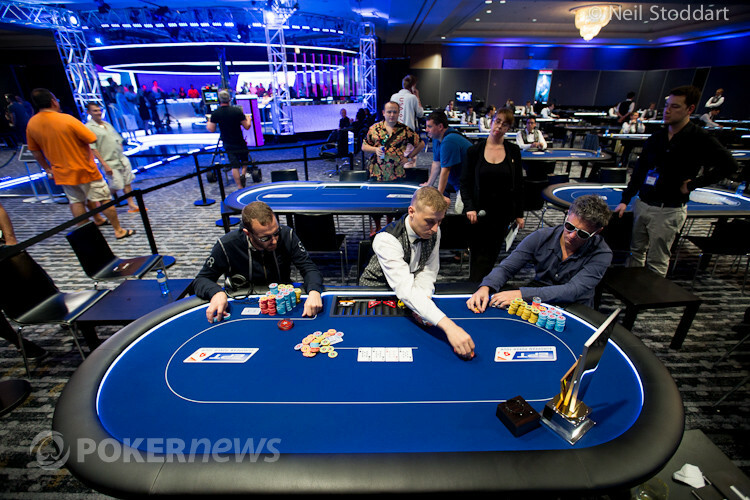 Alex Bilokur raised to 80,000 and Laurent Polito called from the big blind. After the flop, both players checked to see the land on the turn. Polito checked and Bilokur bet 150,000. Polito made the call. The river was the and both players checked. Bilokur showed the for ace high and lost to the for Polito. From the button, Laurent Polito raised to 95,000. Alex Bilokur called from the big blind and the two players then checked the flop. The was added on the turn and both players checked again. The completed the board on the river and Bilokur fired 250,000. Polito snap-called. Bilokur showed the for two pair, kings and eights. Polito showed a better two pair with the and won the pot. In a three-bet pot, Laurent Polito was in position on the flop against Alex Bilokur. Bilokur fired 250,000 and Polito moved all in. Bilokur folded and Polito won the pot. 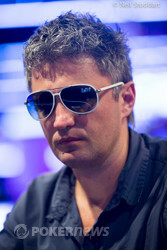 Laurent Polito check-called a bet of 125,000 on the flop from his opponent, Alex Bilokur. The turn was the and paired the board. Both players slowed down with a check and the river landed with the . Polito fired 300,000 and Bilokur folded. The two remaining players are now on a short break.